In 1831, Abraham Lincoln was a young man of 22 when he and a couple of companions floated down the Sangamon River in a flatboat on their way to New Orleans. In mid-April, he neared New Salem, Illinois, a small village founded two years earlier by James Rutledge and John M. Camron. The people of New Salem first noticed Lincoln shortly after he arrived, when his flatboat became stranded on the nearby milldam. A crowd gathered to watch the group of men work to free the boat--included among them was a lanky fellow who had taken charge. Under his direction, the other crew members unloaded the cargo from the stern causing the flatboat to right itself. The tall young man then went ashore and borrowed an auger from Onstot's cooper shop, drilled a hole in the bow allowing the water to drain out, which caused the flatboat to ease over the dam. Denton Offutt, who had hired Lincoln to man the flatboat, was impressed with Lincoln's handling of the incident, and awarded him with the offer of a clerk position in his store. However, when Lincoln returned from New Orleans, the store was not yet open, so Lincoln took a variety of other jobs, including helping to pilot a steamboat down the Sangamon River to Beardstown on the Illinois River. Back in New Salem, Lincoln participated in his first election on August 1, 1831. He entertained bystanders during slow periods of the election. By remaining at the polls throughout the day, he met most of the men who lived in the New Salem area, the vast majority of whom would later help elect him to the Illinois State Legislature. In April of 1832, Chief Black Hawk, leader of the Sac and Fox tribes, along with several hundred well-armed Indians, crossed the Mississippi River into Illinois, with the intention of planting corn. Their arrival caused panic among the Illinois frontier communities, and Governor Reynolds called for volunteers to drive the Indians out. During this time, all white males between the ages of 18 and 45 were obligated to enlist in the militia, and provide themselves with the proper equipment. Lincoln was still employed by Offutt when the call came out, but he saw that the store was about to fail, so he enlisted at Richland for 30 days service beginning on April 21, 1832. Each company elected its own captain. The men in Lincoln's company were friends and neighbors from the New Salem area; they elected him Captain by a huge majority. His term of service expired on May 27, 1832, but Lincoln re-enlisted two more times totalling 51 days of service. Lincoln saw no fighting during this all this time, but he did help bury five men who had been killed and scalped at Kellogg's Grove. Lincoln was mustered out of federal service on July 10, 1832, at White River, Wisconsin Territory; he walked back to New Salem. He would always treat this service lightly, but it did provide him with a knowledge of soldiers and their lifestyles--and a small land grant in Iowa. "Fellow citizens, I presume you all know who I am-I am humble Abraham Lincoln. I have been solicited by many friends to become a candidate for the legislature. My policies are short and sweet, like the old woman's dance. I am in favor of a National Bank, I am in favor of the Internal improvement system, and a high protective tariff. These are my sentiments and political principles. If elected I shall be thankful; and if not, it will be all the same." Lincoln lost the election of 1832, but he gained an enthusiasm for politics that would always remain with him. There were 13 candidates in this election, and out of a total of 8,315 votes cast, Lincoln received 657 votes. Of the 300 votes cast at New Salem, Lincoln received 277. With the election over and with no job, Lincoln looked for other opportunities. He soon found himself a merchant in his own right. In January 1833, he entered into a partnership with William F. Berry to purchase a small store. This venture didn't last long. According to Lincoln, this business simply put him deeper and deeper in debt. In April of 1833, he sold his interest in the store to Berry. Lincoln received an appointment as Postmaster of New Salem on May 7, 1833. He retained this position until the post office was relocated to Petersburg on May 30, 1836. How Lincoln got this job, is not known for certain. According to one source, the women of New Salem were irritated when Samuel Hill, the former postmaster, spent more time serving the men whisky instead of taking care of postal duties. As postmaster, Lincoln was always willing to please customers and would go out of his way to do so. For example, when he knew that someone was waiting for an important letter, he would walk several miles to deliver it. If he was going to survey a piece of land in the country, he would deliver the mail to the people along the route. This job was not a confining one and Lincoln supplemented his post office income with odd jobs such as splitting rails, harvesting crops, helping at the mill, and tending store in New Salem. Towards the end of 1833, Lincoln secured employment as a deputy to John Calhoun the county surveyor. At first Lincoln didn't want the job, but after being assured that the job would not involve political commitments, he accepted it. His formal education prior to his New Salem years was limited, but Lincoln seemed to have an early interest in legal matters. When still a young man growing up in Indiana, he borrowed a copy of the Revised Statutes of Indiana and read it with care. In 1833, he purchased a book of legal forms, and drew up mortgages, deeds, and other legal documents for his friends at no charge, and even argued minor cases. But it was at New Salem that he began studying the law in earnest, with the encouragement and advice of John T. Stuart. Lincoln traveled the 20 miles to Springfield in order to borrow books from Stuart's law office. His diligence proved successful. On September 9, 1836, Lincoln was granted a license to practice law. On March 1, 1837, the Illinois Supreme Court awarded him a certificate of admission to the bar. He had begun the career that he would follow for the remainder of his life; he was no longer "a floating piece of driftwood," as he once referred to himself. 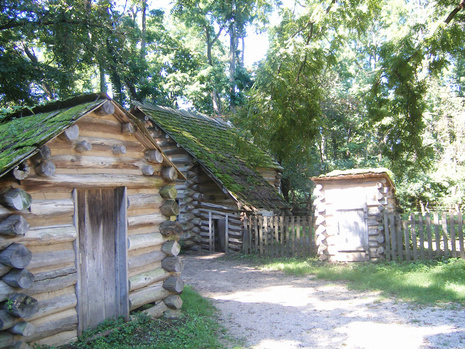 After the Illinois State Legislature adjourned on March 6, 1837, Lincoln returned to the fading village of New Salem. He saw no future there for either legal work or wider political opportunities. Springfield, on the other hand, offered both. He was well known there, and he enjoyed increasing popularity because of his efforts to move the state capital from Vandalia to Springfield. On April 15, 1837, on a borrowed horse, with everything he owned in two saddlebags, Lincoln moved to Springfield, the place he would call home for the next 24 years of his life.